Courteney Cox was once one of the most beautiful actresses in Hollywood. But over the past few years, she became almost unrecognizable with frozen facial features due to too many facial fillers. It left many wondering what happened to the once beautiful “Friends” star. It seemed as if Courteney was yet another Hollywood celeb who went overboard with facial fillers because she was afraid to grow old. But the 53 year old star has opened up to New Beauty magazine about how unhappy she felt after the fillers distorted her face. In the interview, she admits that she has had her fillers dissolved. Now that the fillers have dissolved, the star looks much more natural and she admits that she has looked fake over the past few years. As to why she would ruin her naturally good looks with injections, she says it was a gradual process and that she didn’t realize until it was too late that she had taken it too far. Courteney also admits that the injections made it hard to move her face. Another reason the actress wants to grow older gracefully, is because she wants to set a good example for her 13 year old daughter, Coco Arquette. Courteney says she grew up thinking that looks were the most important thing, and Hollywood made her thinking worse. But, she has not only has she changed her way of thinking now and forgone the fillers, she claims that she has started taking better care of herself in all areas of her life and she feels more energetic than ever. Courteney also makes another confession to New Beauty. She admitted that she wants to have a baby with her fiancé, 40 year old Johnny McDaid, singer of the rock group, Snow Patrol. Courteney’s daughter Coco is from her previous marriage to actor, David Arquette, and since Johnny doesn’t have any children, Courtney would love to give him a biological child. But considering Courteney’s age and the fact that she struggled for years to get pregnant with Coco, Courteney is open to using a donor egg so she and David can have a child. Check back with CDL for more Courteney Cox news and updates. Courteney Cox Plastic Surgery Addiction – Friends Plan Intervention! 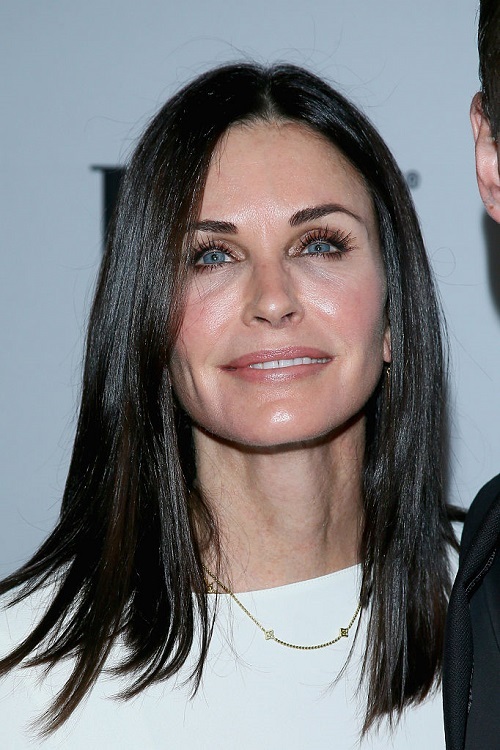 Photos of Courteney Cox’s Frightening Plastic Surgery Nightmare!